Valeri Larko was educated at the Du Cret School of the Arts, Plainfield, NJ and the Arts Students League in New York City. 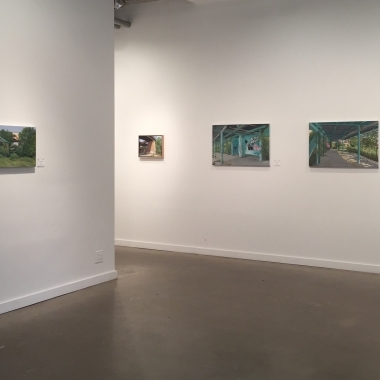 She has exhibited extensively across New York and New Jersey, including her recent retrospective, “Bronx Focus: Paintings by Valeri Larko” at the Bronx Museum in 2016. Her work is found in public and corporate collections such as Jersey City Museum, NJ, Montclair Museum, NJ, New Jersey State Museum, Trenton, NJ, New Jersey Transit, Secaucus, NJ, Rutgers University, Johnson & Johnson, Fox Industries, MacArthur Petroleum, IMTT, Bayonne, NJ, Cooper Alloy, NJ to name a few. Based in New Rochelle, NY, Valeri Larko currently paints at various sites around the Bronx, Brooklyn, and Queens. DOWNLOAD PDF Press Release: "End Game"